You’ve seen touchless faucets in restaurants, stores, and other commercial businesses, but did you know they’re gaining in popularity for home installations, too? More and more Indianapolis area homeowners are installing electronic, hands-free faucets in their kitchens and bathrooms. If you’re building a new home or renovating your current home, here are some reasons why you may want to install touchless faucets. Hands free faucets are extremely easy to use. Just hold your hand out (or touch it with your arm or elbow) and the water comes out. You can easily wash your hands, dishes, and fruit and veggies. Touchless faucets make washing up especially easy for children, the elderly, and people with handicaps, who may have difficulty turning on some hand-operated faucets. Compared to standard faucets, hands free faucets also help prevent scalding injuries since the water temperature can be programmed. Did you know that during cold and flu season, almost 80% of germs and viruses are transmitted by touch? Like other surfaces, germs can linger on faucet handles. However, with touchless faucets, you don’t have to touch the faucet to turn it on and off. So, you reduce your chances of catching a cold or the flu, or giving your germs to another person. Therefore, hands free faucets help keep your family members healthier. Touchless faucets also make it easier to wash your hands during food preparation, which prevents the spread of foodborne illnesses. Food safety is important not just in commercial kitchens. When you’re preparing food at home, you need to wash your hands: before you handle food, after working with raw meat and eggs, after touching dirty surfaces, after coughing or sneezing, and especially after using the bathroom. 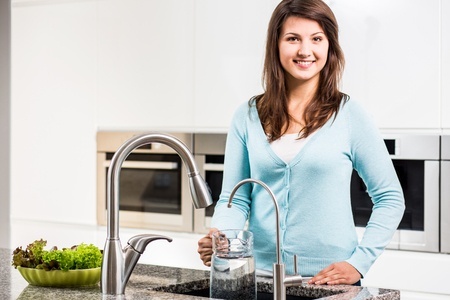 Hands free faucets help you prevent food contamination, which can make your family sick. Did you know every time you wash your hands, you use a little over 2 gallons of water per minute? Touchless faucets use sensors, so they only turn on when they’re needed. Therefore, the water won’t continue to run needlessly while you’re putting soap on your hands, washing your face, brushing your teeth, or doing other activities. Also, hands free faucets can be programmed for a specific water flow rate, so you’re not using as much water as you might be with a standard faucet. And, since the water temperature can be programmed for touchless faucets, you won’t waste water while you’re waiting for it to warm up. Overall, hands free faucets help you lower your water usage, which is better for the environment – and your wallet. If you want to install a hands free faucet in your kitchen and/or bathroom, call 317-388-1988 and talk to the plumbing experts at Pipe Dream Plumbing. We can look at your new or existing sink and help you choose the right touchless faucet for your needs. We can also make recommendations about the right power supply source for your faucet depending on its location. Then, we can professionally install your faucet for you – saving you time (and potential frustration, if you’re not skilled in faucet installation) while ensuring the job is done right – the first time! For more information about touchless faucets or other residential plumbing needs, contact Pipe Dream Plumbing. We want to make your plumbing nightmares go away, so your life is but a dream.